After the rough going of War Music, American Conservatory Theater’s previous show, José Rivera’s straightforward Boleros for the Disenchanted feels like a masterpiece. Rivera’s play has real heart and delivers a powerful, even edgy message about what marriage and commitment actually mean in the long term. We see two long-term marriages in the play, one toward the middle of its span, the other at both the beginning and the end. And though there’s romance, tenderness and true love, there’s also pain, violence, betrayal, righteous indignation and downright stubbornness. Based on his own parents’ love story, Rivera writes with passion for much of the play’s 2 ½-plus hours. He begins in Puerto Rico in the early 1950s when lovely Flora (Lela Loren), her heart broken by the man she thought was the love of her life (a weasley Dion Mucciacito), meets and falls in love with a young National Guardsman named Eusebio (Drew Cortese). Then, in Act 2, Rivera jumps us 40 years ahead to the early ’90s. 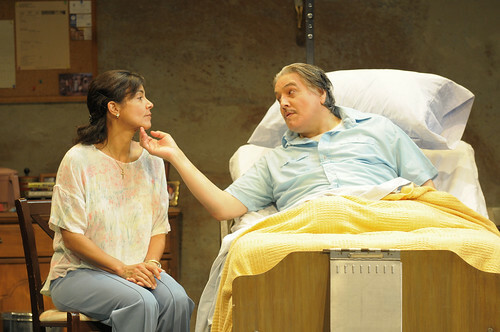 Flora, now played by Rachel Ticotin, is the caretaker of Eusebio (Robert Beltran), whose spirit is intact though his body has been ravaged by diabetes. In spite of a difficult life together, including the births of nine children and the deaths of three, Flora and Eusebio still seem to have the kind of bond that young, idealistic Flora dreamed about in the years leading up to her marriage. They have held on, worked hard and raised a family. Now they’re stuck in Daleville, Ala., lonely and, as the play’s title indicates, disenchanted. But they still have each other and Eusebio’s obsession with his own death. Ticotin and Beltran are marvelous together, and Tictotin displays extraordinary reserves of strength and passion and anger. She is the heart of the play, though she must concede the highlight of Act 2 to Cortese as a priest called to give Eusebio last rites but who instead attempts to reinvigorate the passion and deep connection of a bumpy 39-year-old marriage. At times, Rivera makes marriage seem like a prison cell (emphasized by the Act 2 penitentiary-like set by Ralph Funicello) and at other times like the only conceivable way to get through life as a fully alive human being. The play would probably benefit from a theater smaller than ACT’s beautiful but spacious home. 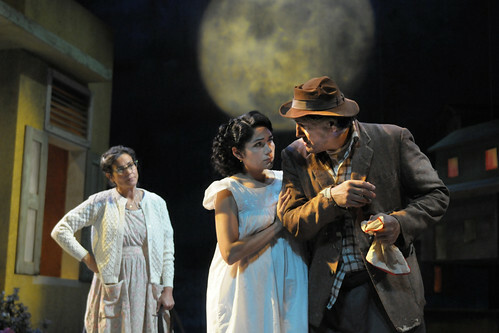 Funicello’s sets, especially in the Act 1 Puerto Rico scenes, overwhelm the actors, who seem to be fighting the space. Director Carey Perloff has trouble moving her actors around the stage in ways that don’t seem programmed to counteract the epic space and its effect on a much more intimate, if over-long, drama. Act 1 feels like an extended prologue that keeps ending and then continuing. The time spent in Puerto Rico with Flora and her parents (played by Ticotin and Beltran) is colorful and dramatic, but there’s a lot of unnecessary time spent with characters who don’t necessarily add to the portrait of a marriage we see in Act 2. When we finally get to the tough, tender core of the play in Act 2 – the relationship between Eusebio and Flora in their later years – the potency of Rivera’s writing finally begins to land. But the distance between audience and actors prevents the play from being as moving as it could and should be. José Rivera’s Boleros for the Disenchanted continues through May 31 at American Conservatory Theater, 415 Geary St., San Francisco. Tickets are $17-$82. Call 415-749-2228 or visit www.act-sf.org for information. You are probably basking the sun in Hawaii. Lucky you. Anyway I could not comment on your review until I sent my off by review on New York on Friday. I have to agree with you about the set in the first act overwhelms the actors. I kept looking at those Puerto Rico shoe box houses many times while the actors were emoting. I did find the first act a little too long and it needs some cutting. I liked the second act so much better. The age old romance between Robert Beltrain and Rachael Ticotin playing the older Eusebio and Flora worked very well. I saw the play day prior to opening. After cutting some slack for early opening, I still was a bit “disenchanted”. I found some lovely language, but a very flat script overall. There was no complexity to the script (hardly a subplot in sight) and moments in the presentation were just left hanging in the air with no meaning, or over-emphasis on a simple point. The set was obviously not complete when I saw it, with some spots not painted. Perhaps more decoration made it overwhelming to the actors by the time you saw it. The acting was commendable, but the play not gripping, and not that funny. Two little old ladies in front of me as I left commented, “well it wasn’t ‘West Side Story’”; and I had to reply, “it wasn’t ‘Who’s Afraid of Virginia Wolf Either’”. It wasn’t very thought provoking and I shed not a tear. I was more moved at the end of “Night at the Museum 2″… not a good sign for the literary qualities of this show. I was so hoping to see at least near great theater when I visited S.F. Oh, well, better luck next time.